Receiving a World Ski Award™ is a world-class achievement that provides you, the Winner, with the ideal marketing tool to promote your award-winning products and services ahead of your competitors. This is your World Ski Awards™ mark of excellence to use across all marketing materials. 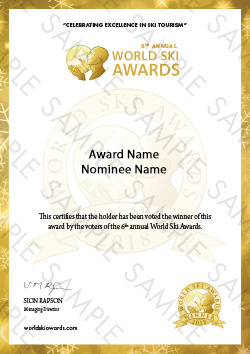 A digital copy of your World Ski Awards™ Winner Certificate. Use this to print your certificate locally, to post online or to use in other marketing materials.